Sulphurs and Boisduval's blues mudding on the banks of Elk Creek along the River Route Road which proceeds up the upper Klickitat River drainage.........June 22, 2008. Unidentified Blue G - a female Silvery Blue or Boisduval's Blue? Unidentified Blue 3 - Boisduval's Blue ? Great Arctic: Oeneis nevadensis - Common in spring and early summer at all elevations on the southeast side of Mt. Adams. Some of these could possibly be the similar Chryxus Arctic? Clouded Sulphur: Colius philodice - ? Lorquin's Admiral: Limenitis lorquini - Common. Painted Lady: Vanessa cardui - Common in meadows above treeline. Mourning Cloak: Nymphalis antiopa - Common in forest openings at the southeastern corner of the mountain in spring and early summer. Arctic Fritillary: Boloria chariclea - ? Northern Crescent: Phyciodes cocyta - ? Mylitta Crescent: Phyciodes mylitta - ? Lilac-bordered Copper: Lycaena nivalis - ? Green Comma or Faunus Anglewing (Polygonia faunus) feeding on Aster foliaceus var. parryi along Island Spring Trail just north of Hell Roaring Creek. 1. The Butterflies of Cascadia by Robert Michael Pyle, Seattle Audubon Society, Seattle, WA, 2002. 2. 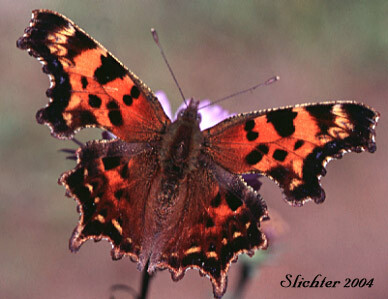 The Guide to Butterflies of Oregon and Washington by William Neill, Westcliffe Publishers, Englewood, CO, 2001.